Whether you’re taking in the snow-covered peaks, rolling tundra and mighty rivers. Or discovering the cities and remote settlements with their strong sense of community. The Alaskan Interior is yours to discover. 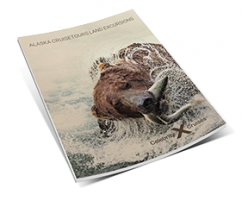 On your Alaska Cruisetour, you’ll stay in the finest lodgings available in the Alaskan interior. 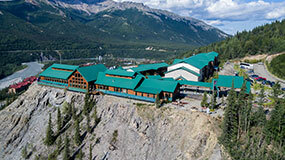 From the luxurious Alyeska Resort with its heated pool offering mountain views, to the comfortable fireplace in the cozy Talkeetna Alaskan Lodge, or the rustic buildings of Denali Park Village tucked into a forested 20-acre site along the banks of the Nenana River, you’ll stay in a range of boutique and local properties. The lodge selection reflects our commitment to providing matchless accommodations in areas of outstanding natural beauty, while also keeping you close to Alaska’s unique communities. Tucked in a luxuriant glacier-carved valley, encircled by the Chugach Mountains and bordering a temperate rainforest, Girdwood is a playground for the artists, extreme athletes, and senators who call her home. Meandering up Mt. Alyeska along the trails mottled with wildflowers to enjoy sensational views, is as pure a Girdwood experience as a helicopter ride to an alpine camp, where Alaskan sled dogs are waiting to be driven. 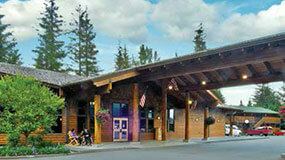 THE HOTEL ALYESKA IN GIRDWOOD — The Alyeska Resort is a luxurious retreat at the base of Mount Alyeska. Amenities include a spa, fine dining, and a saltwater pool with mountain views. Blending cosmopolitan excitement and the great outdoors, the city’s youthful exuberance contributes to its lively nightlife, eclectic dining, and sense of adventure. Beyond the city limits of ‘Alaska’s Big Apple,’ nature commands the terrain. As many as 60 glaciers are located within an hour’s drive. Urbanites can often be found hiking beside their crystal-clear blue walls by day, and by night under the late evening sun, socializing at a downtown brewery and enjoying local craft beer. And even on weekdays it’s not uncommon to find a suited city worker angling for a catch on a lunch break. With 250 miles of trails within the city alone, and moose known to pass through city neighborhoods, or even whales surfacing in the waters along the Tony Knowles Coastal Trail, Anchorage’s long summer days mean more time to explore its natural beauty by day and sample the all-embracing culinary fare long into the evening. 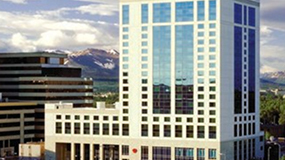 ANCHORAGE DOWNTOWN MARRIOTT — Convenient access to shopping, dining, and cultural attractions in the heart of downtown. endangered birds. Wild animals roam as they have for millennia through unspoiled backcountry of taiga forest, alpine tundra, and snow-capped peaks. The sheer expanse of wilderness, the solitude of Denali National Park’s single road, and its status as one of the last true intact subarctic ecosystems, makes Denali one of the best places in the country to view wildlife in their natural habitat. 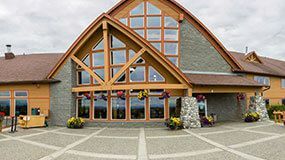 The Visitor Center offers fascinating natural history exhibits, films, and the opportunity to meet and speak to rangers about Denali National Park, including its centerpiece Denali, known as The Great One. Towering at 20,320 feet, Denali is North America’s highest mountain, and still growing. Risen from an elevation of just 2000 feet., the four miles she towers into the sky overpowers the already impressive Alaska Mountain Range that surrounds her. An untrammeled view on a clear day is a profound sight. 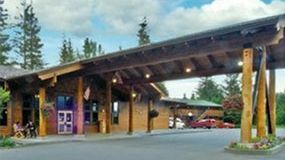 DENALI PARK VILLAGE — This is the perfect base for exploring Denali National Park, with rustic-style buildings nestled into 20 acres of forest along the Nenana River. The main lodge has a coffee shop, saloon, casual restaurant and dinner theater, plus a terrace overlooking the river. GRANDE DENALI LODGE — Situated on Sugarloaf Mountain, experience panoramic views of the Nenana River Canyon and the Denali Wilderness surrounded by log architecture. Just minutes away you’ll find Denali National Park, the Alaska Railroad, and a variety of outdoor activities. Born of a turn-of-the-century trader who found himself stranded in what is present-day downtown, Fairbanks was founded when gold was discovered nearby and the trading post blossomed into a thriving city that outlasted its gold rush boom. Today, locals pride themselves on their independence and endurance, many being descended from Native Peoples and the gold rush prospectors whose self-sufficiency was the driving force of the town’s conception. Hugging the northern bank of the Chena River that converges with the unyielding Tanana, the Chena sternwheelers that navigate Fairbanks’s waters afford breathtaking views of the city and countryside, while also offering a glimpse into Alaska’s rich interior traditions. PIKE'S WATERFRONT LODGE — Since 1959, Pike’s Landing on the Chena river remains a family-run enterprise. From displays of original works by Alaskan artists, to the resident ducks and the greenhouse that supplies the kitchen with fresh vegetables, Pike’s has a style all its own. SOPHIE STATION SUITES — Locally owned and operated, this all-suite hotel is regarded as a Fairbanks favorite. 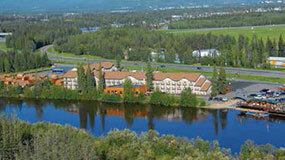 The hotel is conveniently located close to shopping, the University of Alaska, and the Fountainhead Antique Auto Museum. The pristine wilderness of the Kenai Peninsula is home to nesting seabirds, countless islands, wetlands, and breathtaking coastal views. And, as the gateway to the Kenai Fjords National Park, the Harding Icefield — an expanse of ice and snow created over 23,000 years ago — is easily within reach and culminates in 40 glaciers that dramatically calve into the sea. The throngs of wildlife that course below, and glide above the glacial waters, are legion. Pods of humpback whales are known to breach when hunting, seals and sea lions lounge on rocky outcroppings and bald eagles hover overhead. 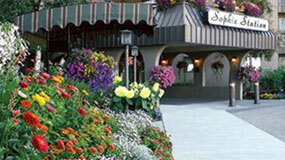 SEWARD WINDSONG LODGE — Enjoy river and mountain views in a forested setting. Dine overlooking the Resurrection River Valley at Resurrection Roadhouse, a Wine Spectacular Award of Excellent winner for the last five years. Among climbers, Talkeetna is recognized as the staging ground for preparations to summit Denali. Mountaineers from around the world start here, filling the town’s hotels and bars with expedition excitement. With a population of under 1,000, Talkeetna’s locals keep the backcountry spirit of Alaska alive. Located literally at the end of the road, the log cabin cafés, gold-rush-era historic district, and Main Street provide a place where you can mill with the bohemians, aviators, and adventurers who call the town home, including Stubbs, the feline honorary mayor. TALKEETNA ALASKAN LODGE — Surrounded by walking and hiking trails, the lodge boasts some of the most iconic scenery in the state. 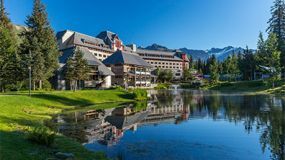 On clear days, the lobby and restaurants enjoy panoramic vistas of the mountains in the Alaskan Range.